On 29 May 2018, the European Commission presented the package of proposals for regulations governing regional development and cohesion policy beyond 2020. For the next long-term budget the Commission proposes to modernise Cohesion Policy, the EU’s main investment policy and one of its most concrete expressions of solidarity, by making its framework simpler and more flexible. One of the main features of the Commission’s proposal for a modernised Cohesion Policy is the focus on key investment priorities, where the EU is best placed to deliver: the bulk of European Regional Development Fund investments will go towards innovation, support to small businesses, digital technologies and industrial modernisation. It will also go to the shift towards a low-carbon, circular economy and the fight against climate change, delivering on the Paris Agreement. The Commission proposes to strengthen the link between Cohesion Policy interventions and the European Semester of economic policy coordination, to create a growth- and business-friendly environment in Europe, so that both EU and national investments can deliver their full potential. Full complementarity and coordination with the new, enhanced Reform Support Programme will be ensured. This programme will provide incentives for all Member States to address key reforms in order to create the right conditions for job creation, growth and investments, thus improving economic and social performance of Member States and boosting their resilience. The released proposal for the Regional Development and Cohesion Policy beyond 2020 foresees an overall 10% cut to Cohesion Policy funding. Slovenia is to receive nearly EUR 3.1 billion in the period beyond 2020, which is a nine per cent cut compared to the current programming period. The new Cohesion Policy framework continues investing in all regions and keeps the three different categories of regions (less developed, transition, more developed). GDP per capita remains the predominant criterion for allocating funds. New criteria are added to better reflect the reality on the ground. 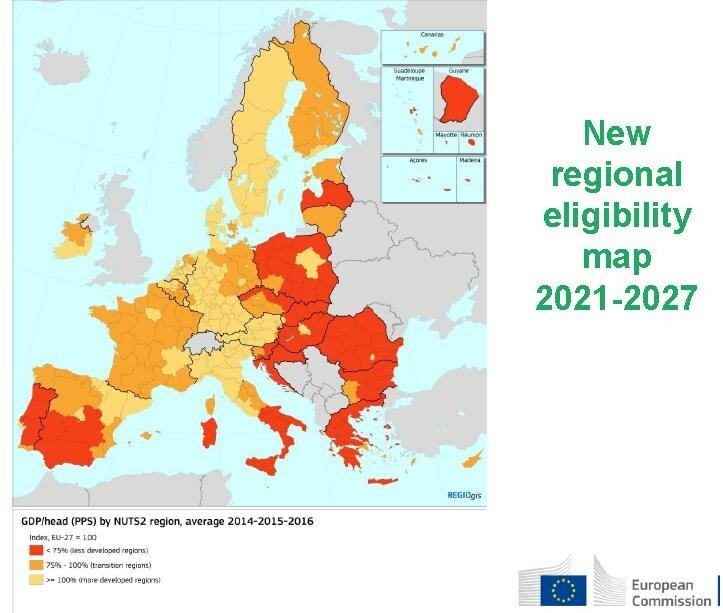 Less developed regions’ GDP per capita stands at 75% of the EU average, GDP per capita in transition regions varies between 75% and 100% of the EU average, and exceeds 100% of the EU average in more developed regions. Slovenia is divided in two cohesion regions, i.e. Zahodna Slovenija (western Slovenia) and Vzhodna Slovenija (eastern Slovenia). According to the 2016 statistical data, the cohesion region Zahodna Slovenija achieved 99% of the EU average, while Vzhodna Slovenija lagged behind with 68% of the EU average, setting the overall country figure at 83% of the EU average. In terms of financial allocation, Slovenia called for a smooth transition between the current and the upcoming period. Slovenia welcomes the fact that the proposed Cohesion Policy budget did not undergo a radical cut stressing that the proposed allocation will enable it to fulfil its commitment to invest in structural transformation of regions across the country, even though Zahodna Slovenija has been keeping pace with the average level of economic development in the EU, and will no longer be considered a transition region. The Commission believes EU funding should complement national counterpart, and the upcoming period will see lower co-financing rates applied. This decision was driven by the need to enhance the sense of responsibility for and ownership of the project by the beneficiaries. The maximum co-financing rate in less developed regions now stands at 70%, and accounts for a maximum of 55% for transition regions (developed regions are eligible up to a maximum of 40-percent co-financing). Revised rules will facilitate synergies and seek complementarities between the European Fund for Strategic Investments (EFSI) and European Structural and Investment Funds (ESIF). Outside of the single rulebook, synergies will be made easier with other EU instruments, like Horizon Europe (Horizon 2020), LIFE, Erasmus+ and Common Agricultural Policy (CAP). The 2021-2027 Cohesion Policy framework will go further local: it will support the development of local growth strategies by urban, local or other territorial authorities, which should now be put in charge of or involved in the selection of EU-funded projects. The new framework will also support the continuation of Community-Led Local Development, i.e. the design of local growth strategies by action groups involving local authorities, civil society and business partners. Thus, the new Cohesion Policy will tailor its interventions to regional and local needs and will target resources where they are most needed. Interreg programmes will continue to help Member States and regions work together across borders to tackle common challenges. The Commission proposes a new instrument, the European Cross Border Mechanism, to help overcome remaining cross-border obstacles by making it possible, on a voluntary basis, for the rules of one Member State to apply in a neighbouring Member States for a specific project or action limited in time. 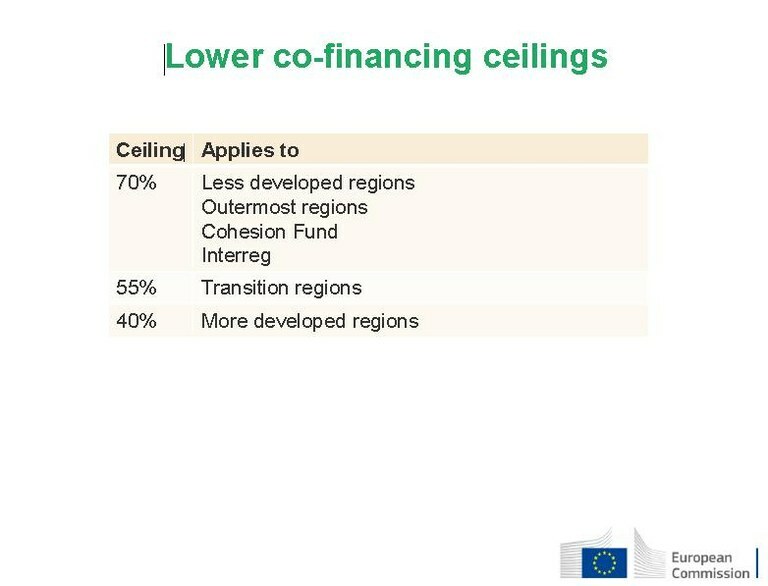 The new Cohesion Policy rules also create Interregional Innovation Investments totalling around EUR 900 million. Regions with matching smart specialisation assets will be given more support to work together. Cooperation outside EU borders will also be promoted (integration of IPA/ENI programmes). Commission will further focus on sustainable urban development; cities are engines of growth and innovation but are also faced with pressing challenges: air pollution, unemployment, social exclusion, etc. 6% of the ERDF will be earmarked for investments in sustainable urban development which will be delivered through local development partnerships with different tools. This will enhance the sense of ownership of EU-funded projects in regions and cities. ESF+ programmes will focus on recommendations and country analysis provided under the European Semester of policy coordination, and they will be geared towards making the principles of the European Pillar of Social Rights a reality on the ground. Targeted focus will be given to supporting youth employment and advancing social inclusion. Furthermore, the ESF+ will support Member States’ efforts towards the long-term integration of legally present non-EU nationals. The ESF+ will support the longer-term socio-economic integration of non-EU nationals with measures to reduce poverty, promote social inclusion and health, and combat discrimination and inequalities. ESF+ will support labour mobility and foster social innovation. The health strand of the ESF+ programme aims to support and complement Member States' efforts to strengthen crisis-preparedness, management and response in the EU to protect citizens against cross-border health threats; to empower health systems, by investing in health promotion and disease prevention, and supporting the digital transformation of health and care; to support EU health legislation; and to foster integrated work towards the European Reference Networks, to tackle, e.g. rare genetic and complex diseases and conditions. 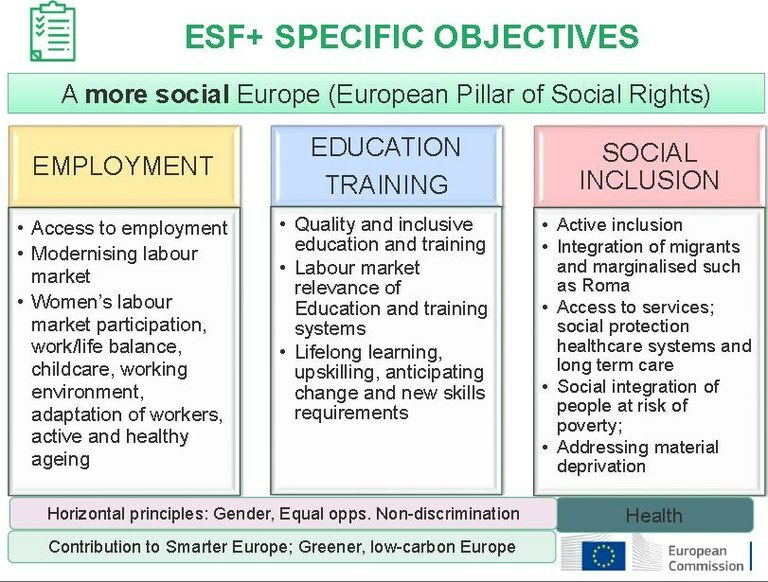 The priorities of the ESF+ will be geared towards making the European Pillar of Social Rights, which seeks to deliver new and more effective rights for citizens and is built upon 20 key pricniples, a reality on the ground. The Commission proposes less complex and more aligned implementation rules for the next MFF, with less red tape and lighter control procedures for businesses and entrepreneurs benefiting from EU support. One set of rules now covers 7 EU funds (the European Regional Development Fund, the Cohesion Fund, the European Social Fund+, the European Maritime and Fisheries Fund, the Asylum and Migration Fund, the Internal Security Fund and the Border Management and Visa Instrument) implemented in partnership with Member States ('’shared management'’), which will make life easier for EU funds programme managers. The Commission proposes 80 simplification measures, including simpler audit requirements and fewer burdens for programmes with good track record and proper functioning of the management and control systems. The selection of ‘’low-risk’’ programmes is based on objective criteria. The number of indicators for general ESF+ support is reduced by nearly half. The new framework also combines the stability necessary for long-term investment planning with the right level of flexibility in order to cope with unforeseen events. A mid-term review will determine if changes in the programmes are needed for the last 2 years of the funding period based on emerging priorities, programme performance and most recent country-specific recommendations. Within certain limits, transfers of resources will be possible within EU funds programmes without the need for a formal Commission approval. Increased use of financial instruments will be encouraged in the post-2020 period. Simplifications will include more flexible combination of grants (e.g. lighter ex-ante assessments, integrated rules for grants and financial instruments, making it easier to master rules, easier to combine grants, etc.). As a general rule, Member States may decide to make a voluntary contribution of up to 5% of each Fund to new "InvestEU" instrument; while rules of InvestEU will apply, cohesion policy objectives will be pursued. Fewer, clearer and shorter rules and a more flexible framework will make things easier for beneficiaries with simpler ways to claim payments using simplified cost options. 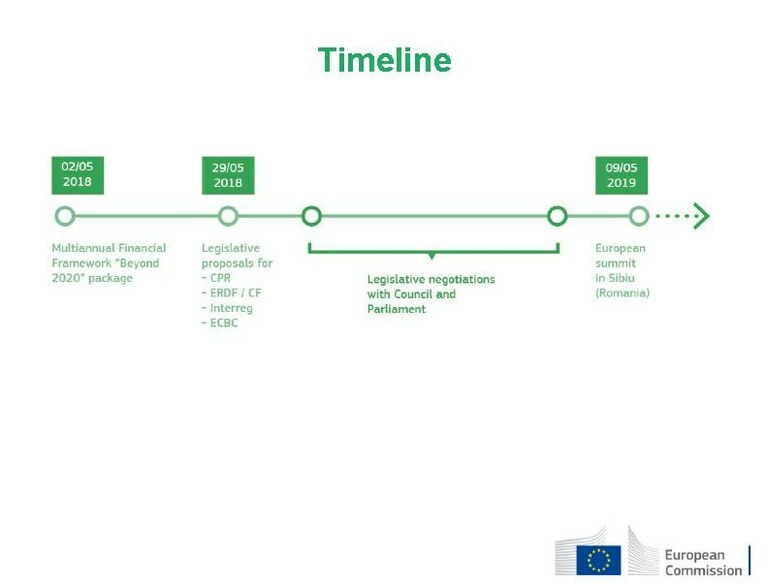 Payments from the Commission to the Member State or region will be conditional on the achievement of pre-agreed results/outputs or completion of policy actions or processes. This ‘’payments based on conditions’’ option represents a radical simplification in implementation as it changes the focus from costs, reimbursement and checks linked to individual projects to tracking deliverables and results for the projects. The Commission also proposes lighter controls for programmes with good track record, with an increased reliance on national systems and the extension of the “single audit” principle, to avoid duplication of checks. Simpler rules will also facilitate synergies, for example between Cohesion Policy fund and the Asylum and Migration Fund when it comes to the development of local integration strategies for migrants, and fight against fraud projects. The Commission proposes more communication efforts to improve the visibility of Cohesion Policy and better communicate the positive results of Cohesion Policy. At the same time, communication on EU-funded projects is simplified, with a single branding covering all different EU funds, a single portal displaying all available funding for businesses and a single project database run by the Commission. A long and heated negotiation between the Member States and among the EU institutions on the 2021-2027 financial framework is expected in the upcoming months, and a series of debates and panels on the future of Cohesion Policy in Slovenia bringing together various national stakeholders. The agreement is expected to be reached in 2019. Stay up to date with the latest news on post-2020 Cohesion Policy by visiting Commission websites for regional development and social affairs.